The Prime Minister, who has been targeting the SP-Congress alliance, charged that the 'two families' have come together in the state to hide their failures. BADAUN: Taking a dig at Chief Minister Akhilesh Yadav's "kaam bolta hai" slogan, Prime Minister Narendra Modi today said it was the SP leader's "karnama" (misdeed) which spoke for him. 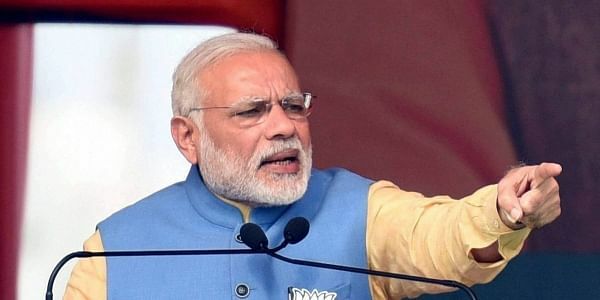 Modi, who has stepped up his attack on Akhilesh in recent da ys, also said that the Chief Minister is to be blamed if people of the state which he ruled for five years do not see 'achche din'. "Akhileshji says 'kaam bolta hai' (work speaks for itself). Even a child here knows that it is your 'karnama' (misdeed) which is speaking for you," Modi told an election rally here. "Akhilesh asks whether 'achhe din' have come," Modi said referring to the SP leader's frequent jibe at Modi over his 2014 poll slogan of "achhe din' (good days). "He is the chief minister for the past five years and if people tell him that it has not come, he is responsible...it is BSP and Congress which is responsible." The Prime Minister, who has been targeting the SP-Congress alliance, charged that the "two families" have come together in the state to hide their failures. "Lohia was against Congress and his disciples who followed ideals of Lohia, came forward and embraced Congress...I have no problem who you embrace, but you tell people as to what you have done for them. "In state elections, why must the old government not give its report card...wherever they are going they have only one thing to say. Ask what Modi has said or done...this will be decided by the people in 2019... you give your account first," Modi said. He also asked why Akhilesh "who had branded Mayawati government as corrupt" and had promised to send to jail the guilty had not acted against them. "Officials close to Mayawati and facing serious corruption charges were given more important posts after a drama of two-three months and doors were opened for more corruption.... What kind of officials were posted in Noida?" Modi asked. Stressing that all the political parties opposed to each other were together on the issue of corruption, Modi said both Mayawati and Mulayam Singh Yadav had never been one of any issue but both were angry with him on his note ban decision. "Why are they so angry with me? ...Mayawati and Mulayam Singh who were opposed to each other, came together on one issue when I waged a war on black money as they found that the ground was slipping under their feet," Modi said.